The next big change is that what used to be "settings.ini" has now been split up into "cluster.ini" and "server.ini" files. cluster.ini contains settings that should be common to all shards that belong to that cluster. For example, the server name and description. server.ini, which you will find in the shards' folders ("Master" and "Caves"), should contain anything else that is specific to that shard server, such as the server port, since each server needs to use a different port. Most of the other files haven't been changed, and you will see the familiar save and session folders nested inside "Master" and "Caves". Mod setting files can be copied into the "Master" and "Caves" folders and should work the same as they did previously as well. I am getting the exact same error message. Any tips how to clear this up? I did not quite understand if master_port and master server port is same or do we have to change the number to the one in your example? server_port and master_port are not the same thing. server_port is used by players to connect to a server. master_port is used internally for slave servers to connect to a master server. Try using 10889.. The ports specified in the guide are recommended for dedicated servers, as they will not interfere with the ports that the game will try to use if you try to host a game from the game client at the same time. yes thanks... I changed it to 10889 and it connected... After 3 hours its running. LOL. before you run the batch file. Here, I've assumed that you want the same mods in both the Master and the Caves, and that you only wanted the worldgenoverride.lua for Caves. Guys, how to fix this error with my server? Thx u so much. @Rykio There is no error, everything looks like it started up correctly! There is no error, everything looks like it started up correctly! When i create Host, this error appear. And where adminlist, blocklist and whitelist files will be in? i'm still getting the same error message... does it matter that i have steam installed on my D: drive instead of C: ?? If that does not work, I will have to get back to you tomorrow. it does not work I guess they will be under Cluster_1 not under save anymore lemme try and I will report back..
it's still possible to custom steam ports? Your server will still start, but some Steam functionality may be missing. So yeah it works like that.. this is the folder that those 3 files should go in. Yes this will still be supported.. However, there appears to be a missing file in the Linux package causing this error. We'll try to patch this tomorrow! Failed to initiate migration for a player forward. [00:11:46]: [Shard] Failed to initiate migration for a player forward. How I download mods and use it? My all mods is gone! I copy modoverrides.lua into those folder，but MODs still don't work. 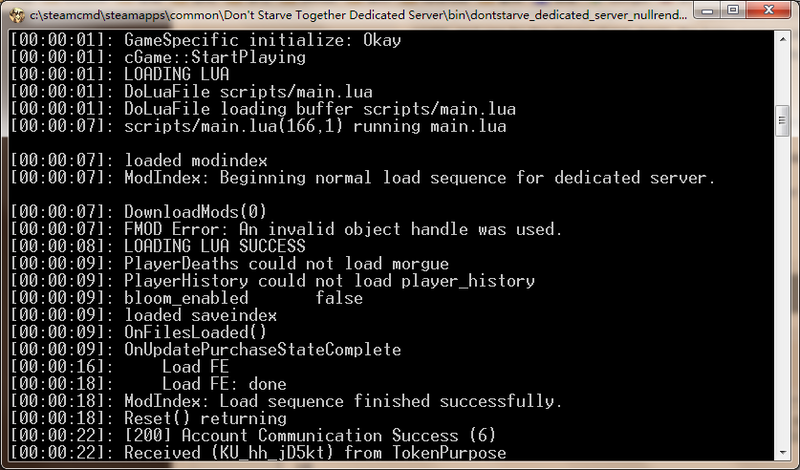 Should the dedicated_server_mods_setup.lua in the dedicated server's installation folder make any change?or there's some other problem?